A solid mid-range all-in-one PC with a few surprises. The Aspire U5 has a few drawbacks, but they can be overlooked given the power and features this all-in-one has packed in. Let high-end enthusiasts and professionals stick with their large-and-in-charge desktops. 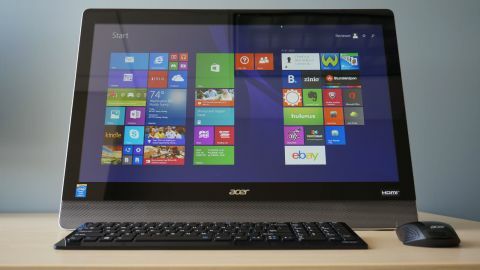 Acer hopes to win over home consumers with compact, affordable, and reasonably powered all-in-one systems. The company's latest is the Aspire U5-UB10. This computer is designed to be a jack of all trades. It handles day-to-day tasks like internet browsing, word processing, and spreadsheets perfectly. But namely, it's built to be a stand out solution for movies, YouTube and internet chatting. Out of the box is an all-in-one system coupled with a tiny keyboard and mouse. While you shouldn't expect much from packed-in accessories, these feel especially flimsy and cheap. The wireless keyboard doesn't have a power switch, a strange oversight, considering the mouse does have one. Neither felt all that comfortable, but they beat poking at the full HD touchscreen to write emails. I ended up replacing them with spare accessories I had laying around. The all-black plastic PC stand can tilt a full 90 degrees. This is great if you want to toss out the keyboard and use the U5 like a gigantic Windows 8.1 tablet – or if you just prefer to stand above the computer and look down at the screen for some reason. The extreme tilt might seem funny at first, but this mode is the ideal for touch-based apps and games, like Halo: Spartan Assault and Civilization V.
For the most part, the U5 is a sharply designed system, though its rear USB ports can be a little difficult to reach. I had to either turn the computer almost completely around or tilt the whole thing over to reach them. The computer is just heavy enough for that to be a bad idea. There's a built-in webcam for internet video chats, complete with a dual mic array that can track the position of your voice. I can't say I do a lot of moving around during Skype calls, so I can't attest to the overall usefulness of the dual-mic system. More importantly, no one had trouble hearing me. As for the webcam itself, it gets the job done. The picture is a little grainy, and it has some minor issues adjusting to bad lighting, but nothing that ruins the experience. Powering the computer is a 2.5 Ghz, Intel Core i5-4200M processor with built-in Intel HD Graphics 4600. Backing that up are 8GB of memory, a 1TB, 5,400 rpm hard drive. Other features are fairly straightforward, like Bluetooth 4.0, three USB 2.0 ports, two USB 3.0 ports, 802.11a/b/g/n Wi-Fi, an Ethernet port, plus both HDMI-in and HDMI-out. While there is a headphone jack, there's none for an external mic. So, if you prefer to use a headset for internet calls, you'll need to pick up a USB one. All of this hardware is tucked behind a large, responsive, 23-inch LED touch screen. The parts might appear on the middle to low end, but the U5 crushes Acer's depressingly under-powered Acer Aspire Z3, and allows for an affordable asking price of $999 (about £582, AU$1,067). These middle-of-the-road specs hit the Goldilocks zone of performance nicely. It's punchy enough to handle most tasks, including mid-range games like Child of Light, but it won't handle high-end photo or video editing applications, or the latest and greatest shooters.